Just seen the first Sweeney Todd trailer in a TV at the bar where me and my officemates always hang together every Fridays. I really don't have any idea about the movie except the fact that it is based on a musical. 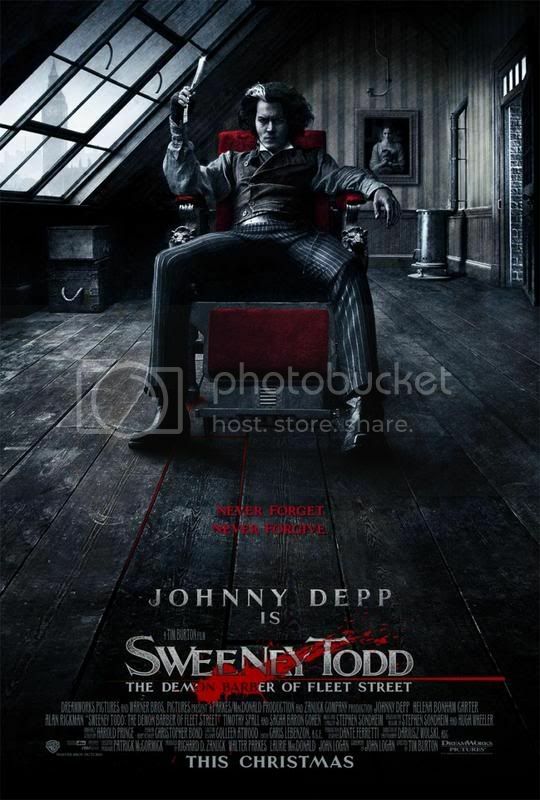 The story revolves around Sweeney Todd (Johnny Depp), who returns to London after having escaped a wrongful imprisonment, only to find that his wife and child have suffered at the hands of Judge Turpin (Alan Rickman), the very man who imprisoned him. With the aide of his former landlady, Mrs. Lovett (Helena Bonham Carter), Sweeney Todd creates a plan for revenge that originally targets the individuals responsible for his hard luck. But in his quest for retribution, he is slowly consumed by his own demon by killing everyone who is in his sight. Sweeney Todd: The Demon Barber of Fleet Street is a 2007 film adaptation of the Stephen Sondheim musical that won the 1979 Tony Award in Best Mucial, Best original Score and Best Book of a Musical. The film stars Johnny Depp in the title role, in his sixth collaboration with director Tim Burton. With Tim Burton, expect Gothic and dark atmosphere for this film. The 19th century setting captures the thriller and creepiness of the legend. The film is scheduled for a nation-wide release on December 21, 2007. I'm so looking forward to this one!! Johnny Depp + Tim Burton = erm... Johnny Depp and Tim Burton. Yeah well this is gonna be another great movie.